← Halloween: Fun or Fright for Fido? for the new arrival is taking up all your time and you can get overloaded with information and advice. Now is a time of big changes for you and those around you, including your best furry friend. Your dog observes all of this activity and can absorb some of that stress. Even if your dog has been a model citizen, don’t just assume he’ll be perfect with the new baby. Children are the most frequent bite victims (Center for Disease Control). Many dogs pine in shelters for the families that gave them up because a baby was on the way. These hurried decisions are largely based on fear of the unknown. By planning ahead, you can successfully prepare your best friend for your new baby. Expectant moms should know about the health benefits of dog ownership that produce positive effects during your pregnancy. Studies have documented stress relief and lowered blood pressure in people interacting with dogs. Some evidence shows dogs experience a similar physiological effect, which may explain why many women report feeling a special bond with their dogs during their pregnancy. If your dog is a little rusty on his manners, (and whose isn’t?) there’s no need to panic. Dogs actually crave your leadership, and will quickly learn to respond to your instructions. Teach your dog to follow your lead now, so it will carry over when the baby comes and you need him to be polite. You can gain his respect with some easy exercises. 1. Your dog needs a job- Include your dog in mom and baby activities like walking with the stroller at a pace you can control. Do your homework now with the empty stroller and you’ll enjoy those nice, leisurely walks later on. 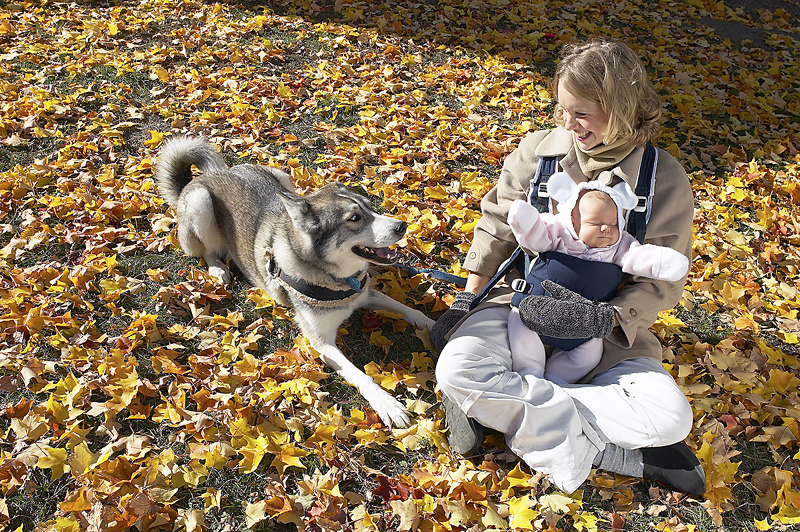 Pull the stroller out and pick up your dog’s leash. When he investigates, give him a tasty treat. Now step outside for your walk with the stroller. Say “OK” and proceed. As your dog gets out in front of you and begins to pull, say, “Wait” and stop completely. When your dog looks back to check on the delay, show him the treat and say, “Come”. Give him the treat as he turns back to you. Now say, “OK” and go forward again, ready to give the “Wait” command as soon as your dog pulls. Walking with you and the baby will make your dog feel useful and important and he will soon be glancing at you for instructions. 2. “Rehearse” good behavior- Would you like your dog to lie down at your feet while you feed or change the baby? Rehearse this now by walking him through the activities you’ll be doing with the baby. Start by putting a short leash on the dog. Bundle up a blanket and hold it in your arms as if you are holding the baby. When you sit down with your bundle, ask your dog to sit, and then place your foot on the dog’s leash and say “Down”. Wait patiently for him to comply and ignore him until he does. As soon as he lies down, slip him a treat you have cleverly concealed in your hand and praise him verbally. Do this once per day and when the baby arrives your dog will be glad to lie at your feet when you sit down with the baby. Check back for part two of this post, with more tips to help your dog follow your lead after the baby arrives.